For a lark, I decided to see just how much lighting was lost when you enter the realm of High Speed Focal Plan Synchronization, aka Auto FP synchronization (Photo #1). There has been a lot of talk about how much light was lost when Nikon shooters used this feature to boost their flash synchronization speeds to accommodate unusual lighting or exposure conditions. As you may know, most digital single lens reflex (DSLR) cameras have a maximum flash synchronization speed. In most cases, it is 1/250th of a second, 1/200 in some of the older models. There are exceptions. The Nikon D50, D70, D40, and the D1/D1X/D1S bodies have the ability to synchronize flash any shutter speed, so long as the burst of light provided by the flash is shorter in duration than the desired shutter speed, and some way can be found to trick the camera into believing that no flash has been attached. 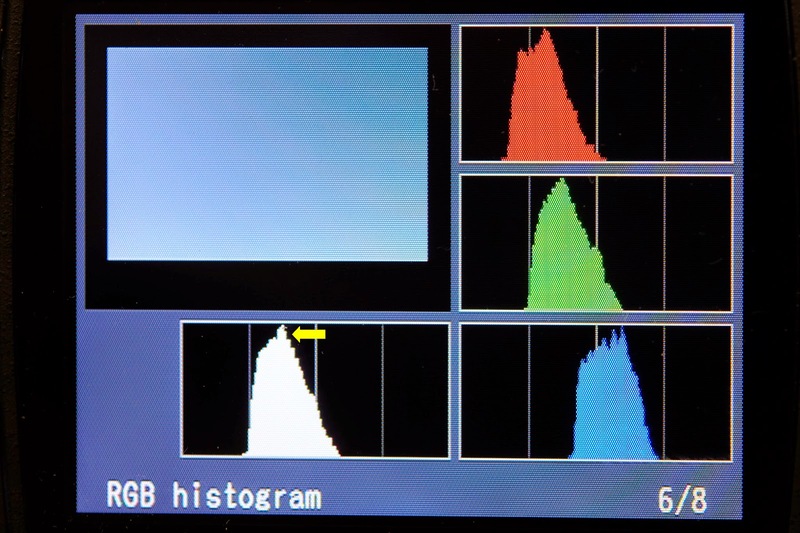 For example, my D70 will properly synchronize at 1/1000th of a second only if I reduced the flash output to 1/4 power. Any setting higher than 1/4 is just wasting light. The methodology for my test was simple. I set a Nikon D80 body for Auto FP Synchronization, and mounted an SB-700 speedlight set to manual 1/2 power in the hotshoe. 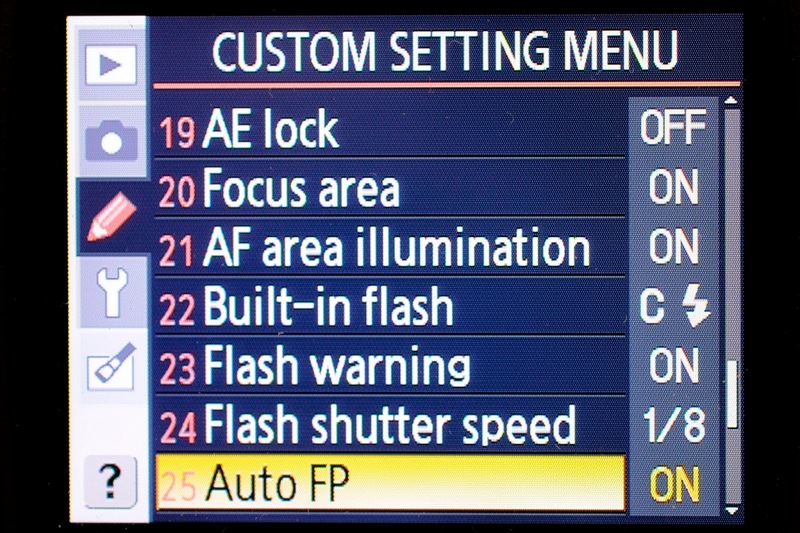 I selected a low ISO value (100), and a small aperture (F 22) for the camera. Next, I photographed a nearly white wall, and then viewed the histogram in the Playback mode. 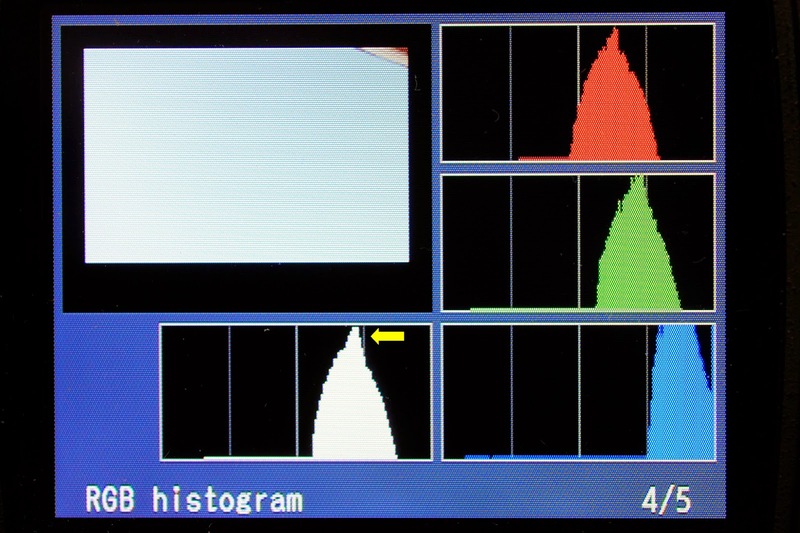 I then opened the aperture by 1/3 of a stop, and shot again until the histogram's peak was aligned with the third index line (Photo #2, yellow arrow). Next, I changed the shutter speed to 1/400, normally one stop of underexposure. But when I made another exposure of the wall, the histogram showed a significant shift to the left (Photo #3, yellow arrow). Based on this visual indicator, I re-shot the photo, opening the aperture up at 1/3 stop increments, until the histogram's peak returned to where it was originally. I simple wrote down the amount of the necessary correction, and resumed the exposure sequence, shooting at 1/800, 1/1600, and 1/3200 of a second exposures. It suffices to say that FP Synchronization requires enormous amounts of power, since so much is wasted, especially at the higher speeds. And you need to keep in mind that you can add a second flash when you need an additional stop of exposure, but when you need two stops, you'll need a total of four. Still, if you gotta have it, you gotta have it. If you want to see Joe McNally, the master of High Speed Synchronization, click on this link and watch him at work. Be sure to check out the You Tube video. I dare you to count the number of speedlights mounted on his "Tree of Woe".